Working in a quilt shop, especially when your job is to check-in new merchandise can be a costly endeavor. Things you were sure held no interest for you may suddenly have appeal when they pass through your hands. I lost interest in cross stitch years ago, in fact I think there are still a couple unfinished projects from the 80s somewhere in the house. But when a pattern for Snow Country Sled ornaments from Foxwood Crossings passed through my hands, I “needed” to do cross stitch again! 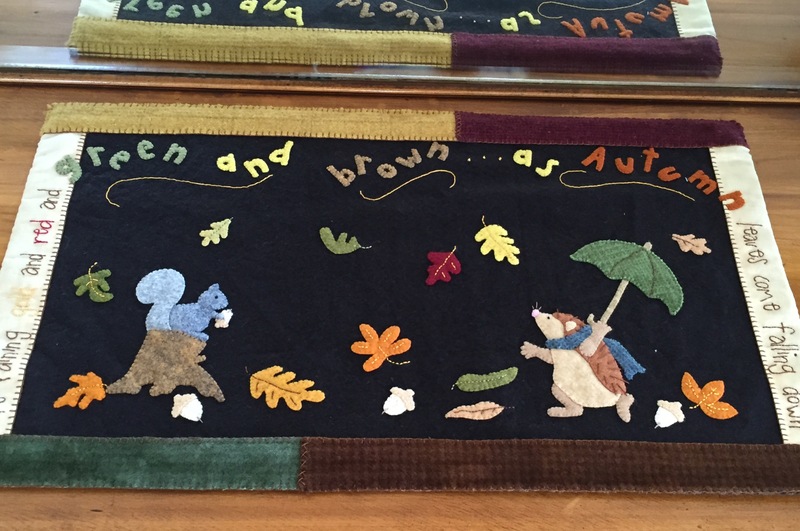 I think my interest in cross stitch has once again waned — until something else exciting passes through my hands. Since the first day of summer I’ve felt too bad to do anything creative. For me that’s bad. Today I finally felt good enough to get up for a while. I looked around at the house thinking Spring decorations need to come down and summer go up (if they finally do this year), and I remembered a project I’d intended to do four years ago! I had seen this pillow in Pottery Barn’s Catalog. While I liked the pillow, I thought I could come up with something I liked even better. I’ve had all the materials and a plan since that time, but every year the 4th of July rolls around and I realize I’ve missed the window again. Today was the day! 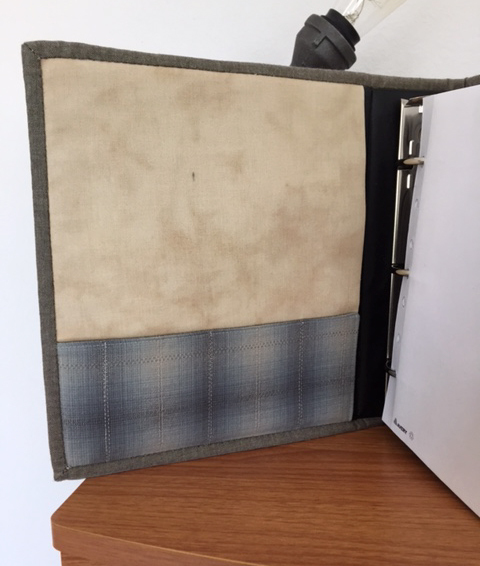 My pillows are not intended to be indoor/outdoor, and they have a plain back, They are also made from three different fabrics rather than one printed fabric. If you’d like to see the process, read on. If not thanks for looking at my show and tell. My pillow forms are 20″. The star fabric is 19″ wide bunting from a Minnick & Simpson line a few years ago. I started by determining the best place to cut the bunting to keep the most stars intact. It turned out about an 8″ finished strip was what worked for me. If I were using other star fabric, that number could change. I could have used solid blue fabric and appliqued, stenciled or stamped the stars. Because I wanted to do flat felled seams on my pillows I used 5/8″ seam allowances throughout. (They looked huge after probably years of working with a 1/4″ seam allowance). So adding the 5/8″ seam allowance to both edges meant I needed to cut a strip 9-1/4″ wide. 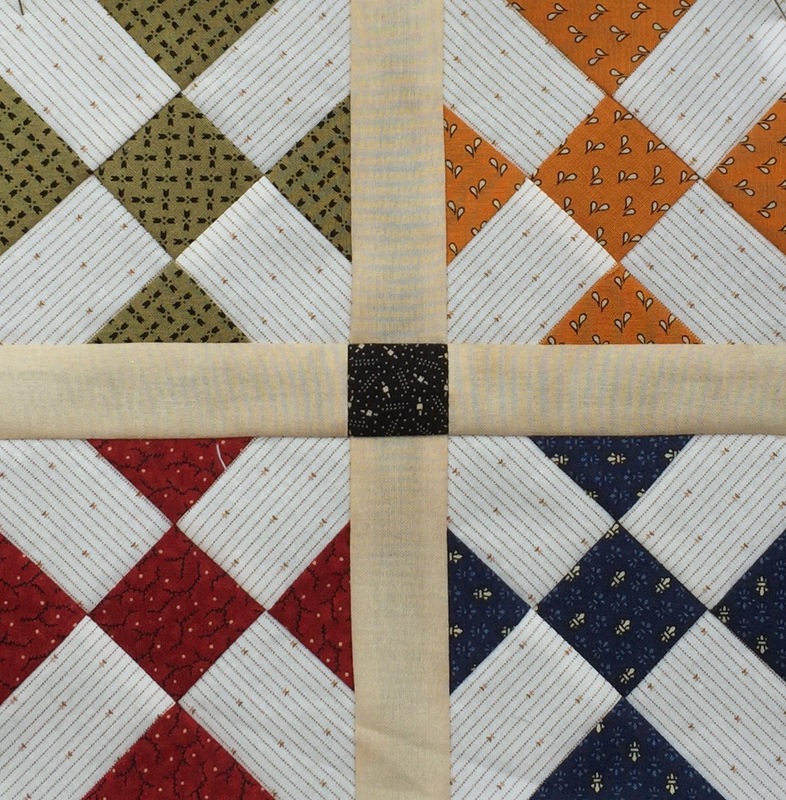 Once the I knew 8″ was taken up with the star strip I divided the remaining 12″ of the pillow form by four stripes to arrive at 3″ finished stripes or 4-1/4″ cut strips. Because I was making two pillows I chose to piece one big section the width of the solid fabric. Because I wanted the double line of stitching on the front of the pillow, I sewed the strips together with the wrong sides of the fabric together. The thread color will show on the right side. I opted to use navy thread through out, but you could match thread to the color of fabric that will be on the top of the seam. Next trim one side of each seam allowance to at least half the seam allowance width, I did about a quarter-inch. The side you trim will be the side you will enclose, so you can decide now what color will be on the top. The remaining side of the seam allowance that was untrimmed, now needs to be pressed under so the raw edge meets the previous stitching line. To finish the flat felled seam, stitch close to the folded edge of the seam allowance. I used an edge stitching foot to keep it even. There are flat felled feet available for most sewing machines. I didn’t have the energy to get to the machine that had one. Press the whole piece well at this point. Cut the large strip into two pieces approximately 21-1/4″ square. I used the envelope back method I’ve shown here before. Just a slight change — width of fabric isn’t wide enough for the back on a 20″ pillow. I cut two rectangles 21-1/4″ x 30″ for the back of each pillow. It’s been a long time since I’ve done a flat felled seam this was a good refresher. I’ve been creative, so now I can go back to bed. Where Do All the Samples Go? Have you ever wondered what happens to all the samples at your favorite quilt shop? At Ruth’s Stitchery if we make it, it is ours when it has run its course. After working and teaching there for over four years I’m starting to have a fair collection of samples that have come home. 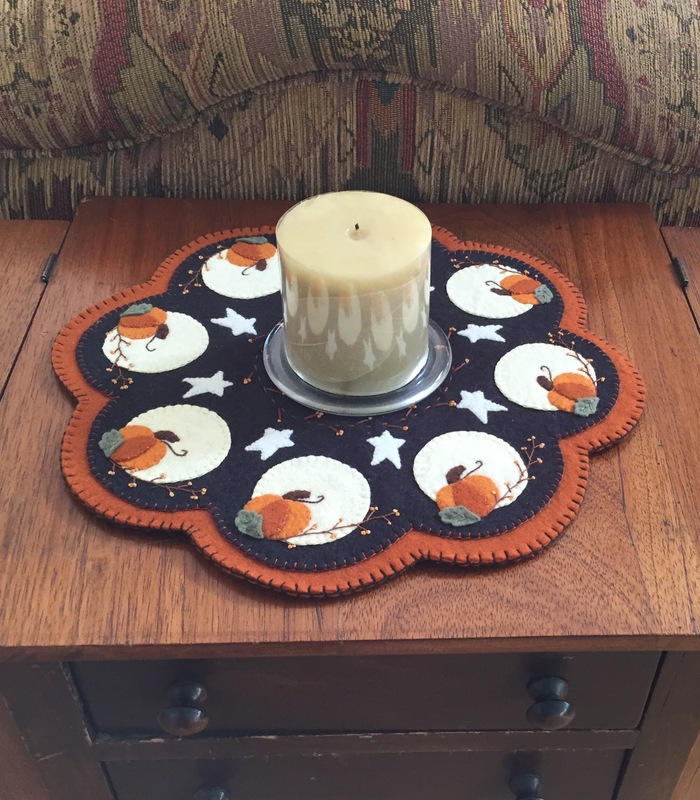 My house is finally decorated for Fall and a large number of samples have found a spot this year. 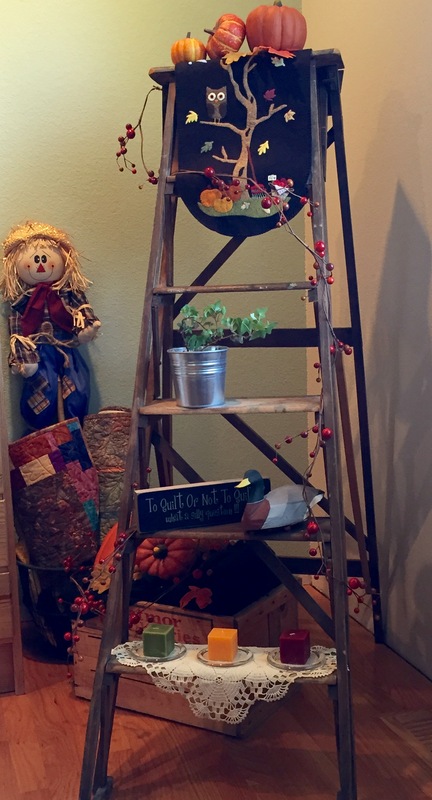 The table runner draped over the top of the ladder was a sample for the wool felt class I taught for 3 years. (The pattern can be found at Nutmeg Hare.) The quilts rolled in the egg basket in back weren’t samples, but were class projects at some point in time. Another table runner from Nutmeg Hare found its way to the top of the buffet. 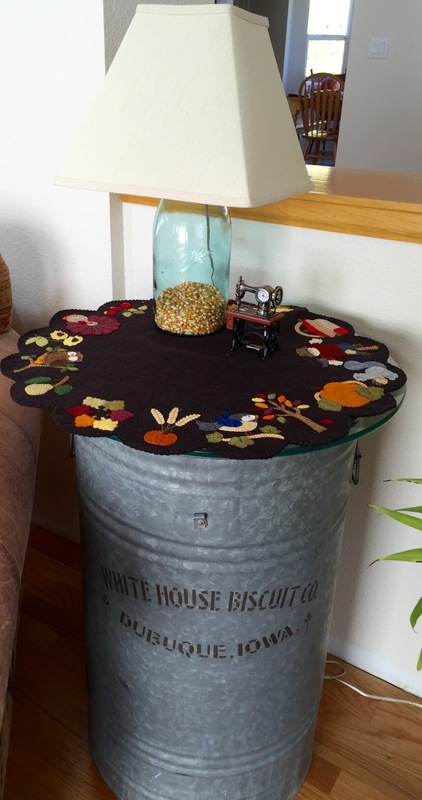 A table mat from Brandywine Design made it home, and onto the top of a can turned end table. 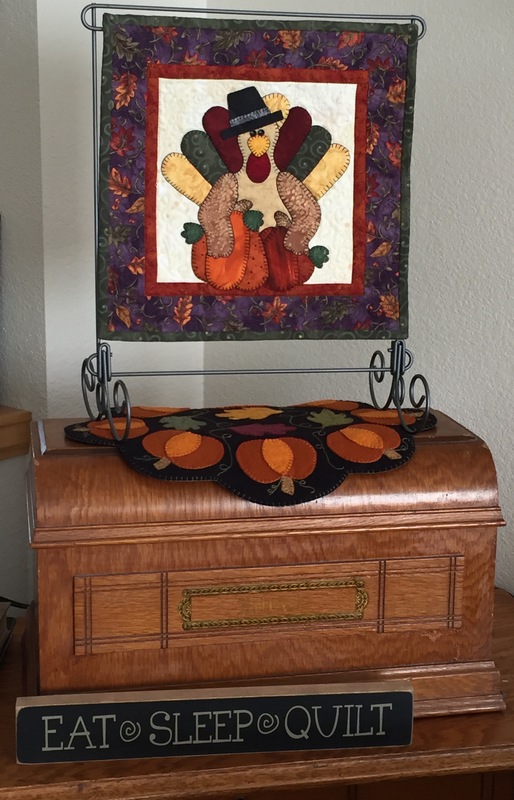 The turkey (pattern from The Wooden Bear) was just something to keep me busy while I went to watch my boys in a soccer tournament. 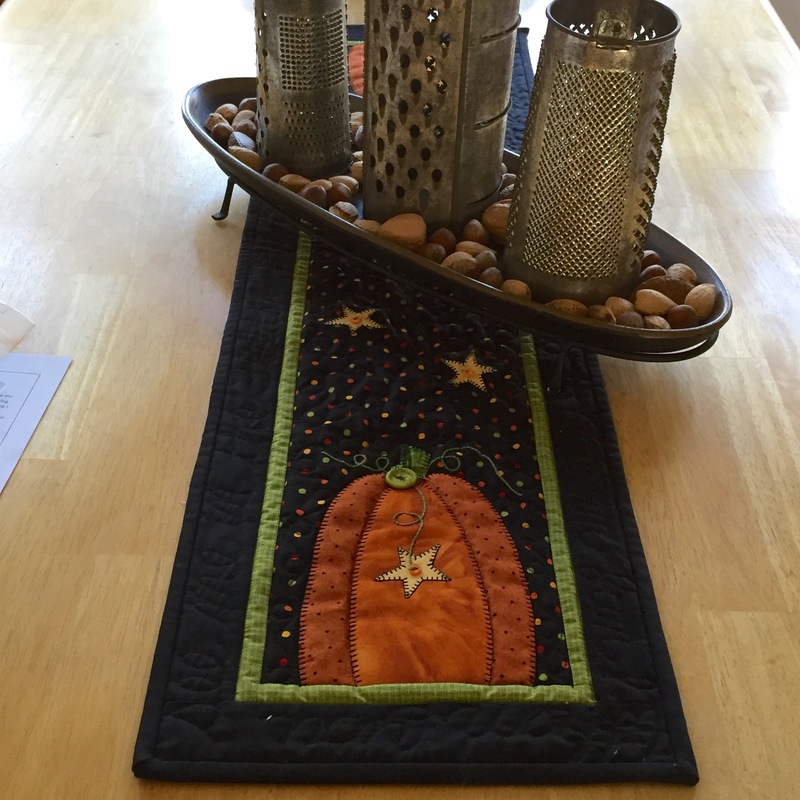 The penny rug below it coordinates perfectly, and that was a sample (the pattern is from Annelle’s Originals). 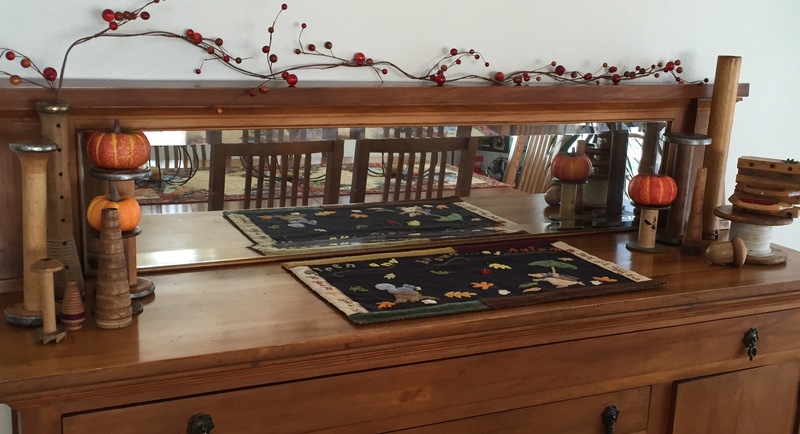 This Harvest Moon Penny Rug (pattern from Penny Lane Primitives) is sitting on my Martha Washington sewing cabinet. Finally just a shot of the fireplace mantle. No samples here, just playing around. You’ve heard of time in a bottle, how about kids in a jar. OK, I doubt they’d appreciate it, but they are away at college so I can do what I want. Now you know where some samples go. Are you a person who likes a surprise, or like me do you read the end of the book long before actually progressing to that point? I admire the people who sign up for a mystery quilt with little to no idea of what to expect for the end result. I may admire them, but I’m not one of them! I want to know what I am making! All this leads up to how I am involved with a mystery quilt. It’s simple, I choose them and lead them, so yes I do know the end. Today is the big reveal . It is very different from the one we did last year, and the colors might not be for everyone. But, I love how it turned out. I took the photo in a classroom with flourescent lighting so the colors aren’t true. 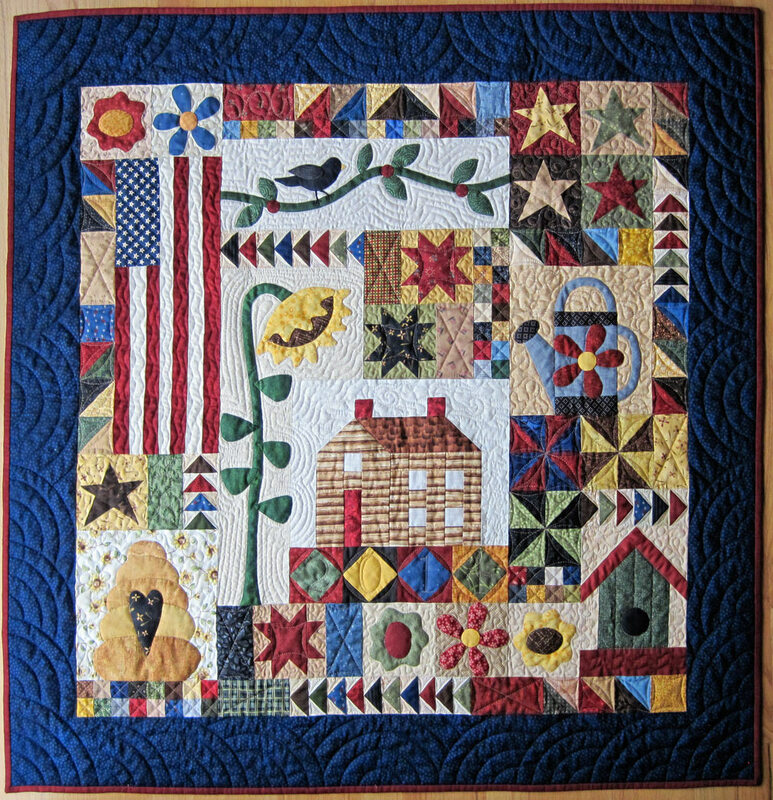 It seems there are other people wanting to “read the end before it’s time.” I loaded the tutorial video for putting the whole quilt together last night and when I looked at 6 am there had already been 20 views. 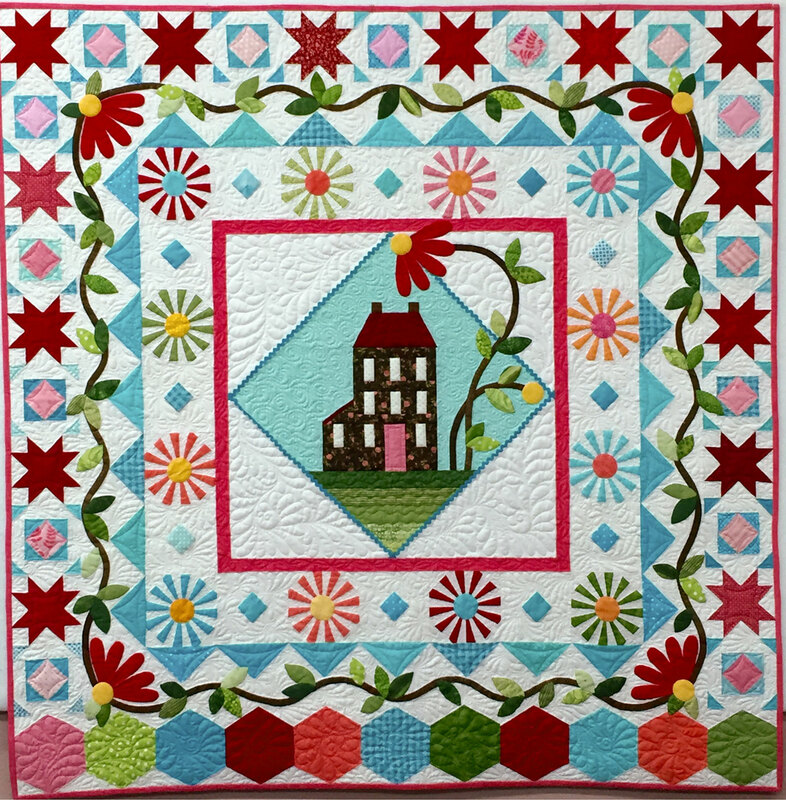 Finally to give credit where it is due, the pattern for this year’s mystery was “Little House in the Garden” by Under the Garden Moon,. PS, in the event a measurement in the presentation conflicts with one in the pattern go with the one in the pattern except for the one I called out as incorrect. I continue to live life at a frantic pace, but rarely slow down enough to write about it lately. This year I’m teaching Stitching Society at Ruth’s Stitchery. Which means I’m making lots of little motifs and working on learning some new hand embroidery stitches well enough to teach them to others. I also spend a little time researching the history of various things — needles, thread, pins so far. It’s fun, but overwhelming at times. This month for the small project I made the binder cover. I chose to add pockets to the inside, they are not included in the pattern. I promised my students I would upload my pictorial guide, I am including measurement because that information is available in the pattern. Here is the guide as a PDF Binder Cover. Based upon the number of posts I’ve made this year, one could assume all I do is going to work then come home and collapse at the end of the day. And while that is often the way I feel, it isn’t in reality the case. One of the things I’ve been doing over the last twelve months is leading a mystery. Participants enrolled last fall and paid for the first block. After that as long as they brought their finished homework on the next first Thursday of the month they got their new kit for free. Big deal you say, all you have to do is construct the block each month. Not so, I chose the fabrics each month, cut and packaged the kits for each participant (yes, the cutting was mostly at work, but eventually the packaging came home with me). 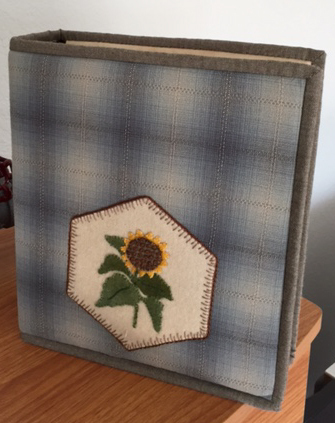 I had to make my sample (before class — what would I ever accomplish without deadlines?) as well as demo pieces. If that wasn’t enough, I decided to do video tutorials for anyone that missed the demos in the store. So if you’ve missed me, you can actually go watch the videos on the Ruth’s Stitchery Channel on YouTube. I sound like I’m in a water tank because I removed background noise with software, maybe the background noise would be better. I demonstrated several techniques that were not included in that pattern. 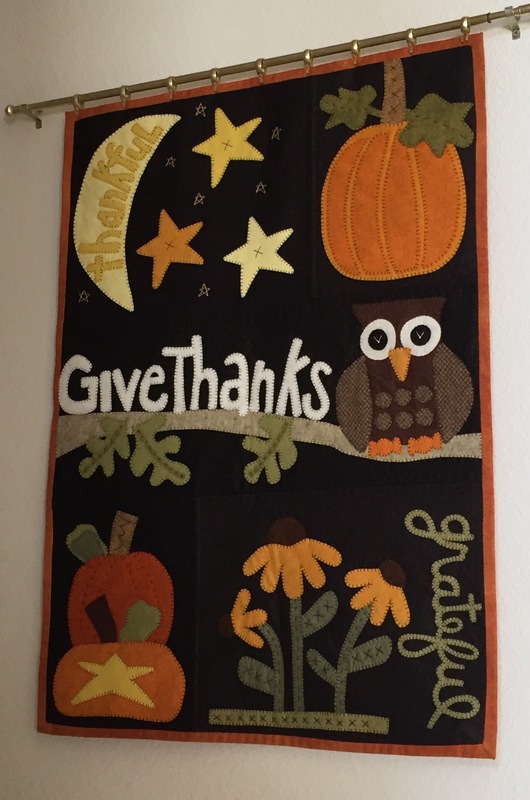 For instance, the pattern used starch and press exclusively, but I demonstrated starch and press, fused, freezer paper, facing and back basting applique over the months. The mystery started in October 2013 and the reveal was this month. Now that it has been revealed, I can say the pattern is Blackbird at My Window by Under the Garden Moon. 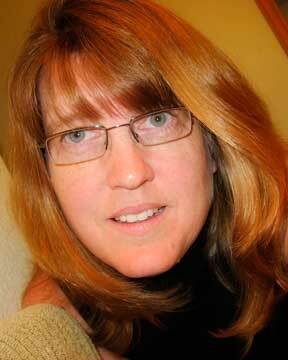 I am starting another mystery in October. It is the same concept, but a completely different quilt. If you are interested, registration is open until September 21, 2014 at Ruth’s Stitchery in person or by phone. The kits can be mailed, but in that case they are $5 per month plus postage. Anyone that doesn’t come in on the day of the demos also must pay $5 for the new kit. Not Using a Reader? Want to recieve an email when I manage to write something new? Enter your email address in the box below and click to subscribe.